Connecting Flight – ch. 4 | brainsnorts inc.
Oh, also, don’t worry about the picture not matching up well with the description. Just something I plucked off the internet. Ann eyes followed his to her right. The train they had ridden was now in the distance, rumbling west. With lights still flashing, a crossing gate was just reaching its upright position and traffic was poised to resume in two lanes each way. Across the road there was a train station that looked every bit how a station would have looked 100 years prior. Ann’s first thought was that it was a tourist attraction, no longer used but restored by a local historical society. “There’s something over there,” Chris said. “You think it’s real?” she asked. She shrugged, and they slowly walked towards the station, still more than 100 yards away. As they grew closer, a taxi pulled up and let out a passenger who then walked into the station just as another exited. “Guess it’s real,” Ann said with an exhale. They continued to the sidewalk and stood across the street from the station, careful not to touch any of the many people strolling by. “You think we need to avoid people?” Ann asked. “Well, a few of them seemed like they’re looking right at me.” He glanced at every face possible in passing cars. “How do you know they’re not just looking at something behind you and it just seems like they’re looking at you?” she asked. “I wanna try something.” She stepped slightly into the street towards the traffic driving from her left to right. She stepped again, then a little more. Chris watched quietly, his eyes squinting and mouth contorted like a parent whose kid was climbing a tree for the first time. He watched the path of the cars coming by, and they didn’t seem to be wavering despite how close they were coming to Ann. She looked back at Chris to see his concern, then she turned again to the traffic. The next car was about 30 yards away and approaching quickly when Ann stepped completely into the middle of the road. Chris watched as the coming car slowed to a stop, barely a few inches away. Her face twisted in confusion as she attempted to hide her eyes. She put her head down and walked back to where Chris waited smiling. Instead of answering, Chris waved her around so she could see the crossing gates descending, lights flashing, and bells beginning to clang behind her, blocking the road for an oncoming train. 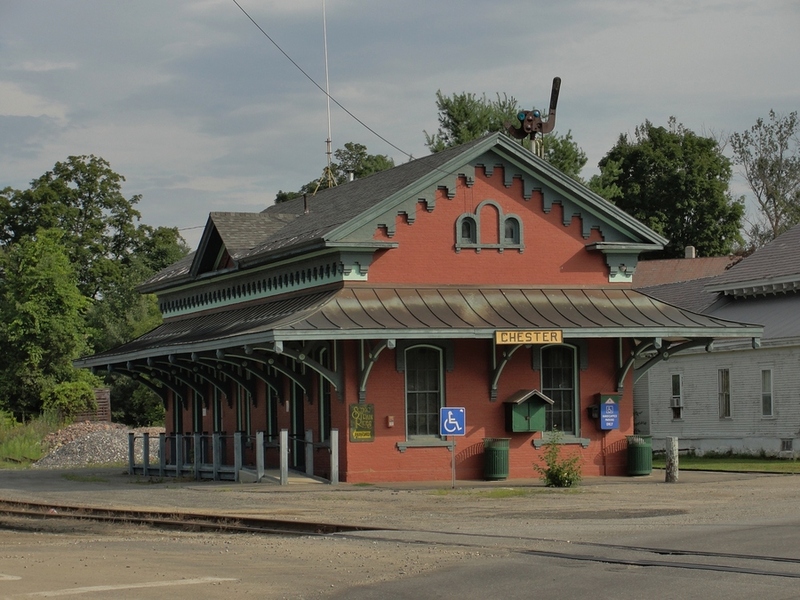 That station was a red brick building, one-story tall with a pitched, dark green, aluminum roof. The late-afternoon sun was dropping behind it, and the shade it created reached to their side of the street. To the right of the building was a street-level, wooden platform on which a line was growing. The red and silver train responsible for dropping the crossing gate was hissing to a stop. As they crossed the street, Chris spotted a man who seemed like a vagrant. The elderly man in slightly stained clothing shuffled around the corner from the rear of the station. He stood near the train but off to the side, away from the steps, as passengers departed from the train. “Ain’t that a beauty!” Chris said. Chris’s eyes followed the gold letters that announced each car joined together behind the diesel engine of the Texas Sunset. “Trains are superior forms of travel that are incredibly underused and undervalued,” he preached. “Sleeper cars, dining cars, and-” He caught her eyes rolling again, so he saved the rest of the speech for another time. A short line formed and waited for others to finish exiting before boarding. Two unseen people, new to this part of the country, and this unloving dimension, also waited. They waited until the last person was up the short stairs, and then Chris came face to face with the elderly man who had previously stepped out from behind the station. The man turned away and leaned down, reaching for what looked like a few coins, thus allowing Chris and Ann to get aboard before him. They boarded slowly, trying their best to avoid touching anyone. “Hold the back of my sweater, and stay with me,” whispered Chris over his shoulder. “You want me to get another shock?” she asked. “Not if you only touch the sweater.” He was right, and she followed close behind. Chris guided her through a mostly empty car with lounge seats arranged for conversation and view. The afternoon sun cast horizontal shadows as they stepped towards the rear of the car, into the next car, until they found one that was empty. They parked themselves in wide, soft-leather chairs aimed at the windows. Chris leaned his head back and closed his eyes, waiting to feel the warm rays on his face. And he waited, but there was nothing. He sat up. “Except we’re not life anymore. Do you think we’ll need to sleep?” Ann asked. “Be a lot faster to fly,” she said. He slumped back in his seat. They both stayed silent, eyes closed, until a door opened and scattered people wandered into the car. They hopped from their seats and found an out-of-the-way corner in which to tuck themselves. Although they were certain they could not be seen, they still cowered and winced each time someone got too close. Eventually every seat was filled, and others continued to the next car until the cattle call subsided. As conversations picked up, Chris and Ann sat on the floor beneath a big-screen TV mounted on the wall. Ann moved from the corner and cautiously walked around the car as the train proceeded from the station. Although other passengers rocked slightly from the unexpected jerking as the train began rolling, Ann moved effortlessly. Chris watched with surprise as she stopped behind a 30-something woman with a book in one hand and a bottle of water in the other. Ann glanced back at Chris, then again at the woman seated in front of her. Ann reached out a finger and gently ran it through the woman’s curly hair. It was as if the woman was just a projection of light and Ann’s hand was waving at color-tinted air, moving through her as if she weren’t there. Ann shook her head and shrugged. When she leaned over and gently blew on the back of the woman’s neck, things were different. The woman shrugged her shoulders up and looked around the car behind her. Ann looked back in a strange triumph before continuing to another seat. She reached her hand out to touch a different woman’s shoulder, but there was no reaction this time. She pushed on the shoulder, leaning more forward, but still nothing. She kept her hand inside the woman’s shoulder and looked back at Chris, about to say something, when she abruptly pulled her hand away as if touching a hot surface. Surrounded by concern, Ann stepped back to Chris. “Maybe that explains how you knew things about me,” said Chris. Ann walked back towards the woman, around her chair, and stood in front of her. Then she turned, bent her waist and knees, and sat in the seat. For Chris, it was as if Ann disappeared into the woman’s body. He watched silently, barely blinking. About a minute later he saw a blurred, then clearer vision of Ann standing up again before she tiptoeing back to Chris. His eyes bulged with anxiety. She looked up with similar eyes. “That was – that was -.” Her confusion showed as she searched for words. “It was like that. Listening to someone on the phone when they don’t know you’re listening. I mean, I know it’s wrong, but it was amazing.” She turned to see the woman place her book on the seat and leave the train car. “She’s going to find a bathroom, I heard her say she had to take a piss,” Ann added. “What else did you hear?” Chris asked. “She said all that?” Chris asked. “Don’t think so, but you gotta try it,” she smiled. Ann moved through the car carefully, avoiding touching anyone, until she reached the younger woman’s seat. She stood in front of the toe-tapping, gum-chewing, head-nodding demeanor. She smiled, turned, and sat. Chris estimated her age at about 25. He watched her ponytail sway slightly in tune with her music. After roughly a minute, Chris noticed that the woman hadn’t turned a magazine page since Ann entered her. Her eyes seemed to be focused elsewhere, her attention not on the pages. She let the magazine fall on her lap as her head relaxed back on the seat’s headrest. Her legs had been crossed with one foot tapping to the music, but she uncrossed her legs and pulled them up against her chest. She pulled the earphones out and put the music in her shoulder bag on the floor beneath her. Then she tilted sideways, almost lying her head on the armrest. Chris looked at a clock on the wall and estimated she had been curled up about ten minutes. He struggled with worry before moving towards her. He stood behind her, leaned as if he were going to whisper, but then backed away. Twice his lips twitched, but both times he held back. He went back to the corner beneath the TV and waited. Before he could lean against the wall, Ann returned. Again, he waited for her to speak, but she took longer than before. She sat on the floor next to him, again curling up in her trademark fetal position, leaving him wondering again what had happened. He sat down next to her. Chris looked around the room and stopped at a man with glasses, a notebook on his lap, and a pen in his hand. Like Chris, he was about 35 and conservatively dressed. Chris said nothing, stood, and approached him. The man was scribbling across lined paper. Chris turned his back to the man and looked over at Ann. After her positive nod, he casually took a seat on the man. Ann watched as the man’s pen stopped. He took off his glasses, looked at them curiously, and attempted to clean them with his shirt. He put them on and off again, looking at his notebook, on and off again, and then put them on top of his head before going back to writing. He wrote a few words, stopped, looked closely at the page, and wrote some more. He did this several times, each time looking closely again at the page until finally he clicked his pen, put it in his shirt pocket, and looked out the window at the passing mountains. Slowly, a vision of Chris, seen only by Ann, rose from the man’s seat and trudged back to Ann in the corner and again sat next to her. “Well?” Her eyes darted from his eyes to his lips and back. A noise drew both sets of eyes back to the man when he ripped the top page from his notebook and glanced around at the population of the train car. “What did you do?” Ann asked as Chris caught his breath. “No. I didn’t notice,” he said with disappointment. Chris searched. “It was quiet. I couldn’t really hear anything like I can now. Not the train wheels or the pen on the paper. I could see, but it was like looking through binoculars. I mean like, I couldn’t see off to the sides much. Like blinders.” He held his hands to the side of his eyes. “But I felt his sadness from what he was writing. And I connected with that from, from all this, and it pissed me off. I mean, how do you write a note to your kid and not say I love you? People are messed up. If you’re not going to love them, then why have kids?” He looked down at his feet as he rested his head in his hands. “Angry,” he said. Neither spoke for a half hour. “I used to love trains,” he mumbled. “You still do,” Ann said. The door opened behind him and a man stepped in. Then the boy dashed through before it closed. “Should we follow him?” asked Ann. “It was my idea,” she said, voice rising. Chris glanced around as if someone might have heard her. The words hadn’t finished reaching his ears before the regret showed in her eyes and slumped shoulders. She glanced down, up at his eyes, down again, and headed towards the door through which the boy disappeared. At the door, she tentatively reached a hand out to the door handle, but her fingers went through it like nothing. She put her hands on her hips and looked back at Chris. “Walk through it,” he said. Neither moved. They just stood, looking at the door. “And what if I don’t? What if I smack my face into it?” she asked. He looked at her, looked at the door, and stepped forward. Question 1: Other readers thought that the scene with Ann testing cars to see if they would stop was awkward and just did not fit the story. How did you feel about it? Question 2: How did you feel about Chris and Ann “entering” people? Did it make sense for them to attempt that? Question 3: What do you think should happen when Chris attempts to walk through the door at the very end? Q1 – I wouldn’t say the scene with Ann and cars is awkward – I understood the motivation, but it confused me as to whether people could, or could not, see them. It didn’t seem to fit with the people in the train car who can’t see them. I’m guessing there is a reason you put it in though, maybe it just needs a little more clarity – or a reference to the oddity by the characters? Q2 – I really liked that part – could you refer back to the ‘Ghost’ reference (I can’t remember if it was Ann or Chris who mentioned it): after all, that’s what Patrick Swayze did to Whoopi Goldberg, so you could link back to this in some way perhaps. It certainly didn’t make me feel uncomfortable, as your characters appear quite respectful and compassionate. Q3: I’d like to say he can walk through it, but that would just be too easy. There have been a lot of questions and discovery for these two so far, therefore I’d suggest, as a reader, this would have to give them some indication of an answer to one of their questions – like why they can touch some stuff and not others. I feel it’s about time they faced some more challenges together, an obstacle (physical or otherwise) to complicate the story and create some more action. One other thing: is there any other way of expressing the phrase “I want to try something” – they’re saying it quite a lot and it gets repeated a little too often…Maybe replace with the occasional ‘Hmmm, I wonder…” or something like that? Loving the characters though, they feel very ‘real’ despite circumstances. Am poised to keep reading! as for the first question, that scene is mainly just supposed to be a light, comic moment, but it probably is not worth the effort and possible distraction. also, it was a chance for chris to mention that some people seemed to be able to see him. so the idea – which isn’t totally working – was to say “hey, they can see us” and then a car stops in front of ann, as if it can see her – but then it turns out the car only stopped for the train crossing gate. so feedback is largely that it doesn’t completely work, and i have no trouble removing it. Hmmm, I think you might be right. Unless you can make it more explicit that the car stops for the train crossing – I didn’t get that bit. It’s interesting to watch this process – I feel like reading the feedback you get could also help me look out for similar issues in my own writing. coming today is chapter 5, but i have a bit of a dilemma with that. one reader suggested to me that chapters 5 and 6 need to be reversed. i think it might be a good point, and i’m going to spend today figuring that out. i have 5 ready to go, but i want to review 6 just to see if i should make that one 5. right now, i’m 50/50 on it. i know that doesn’t help any for you – not yet – but i fear that if i get it wrong, then i’m going to lose people. ugh! it was mentioned, possibly by both you and valentine, that there needs to be a physical test. that’s chapter 5. but there also needs to be a more clear “direction” of where the story is going, what’s the problem, what are their goals and risks. that’s chapter 6. 5 is ready, but 6 needs one more revision before i can post it. I’m willing to wait. It’s important you get this sorted out for yourself. I’m also happy to read all the way through – so you won’t lose me: I know how difficult it can be to find honest feedback on work, so I’m happy to help out. well that only adds to how lucky i am to have gotten your attention with the story. thanks very much for your time and patience. I would like to see both Chris and Ann express more confusion / fear of their new situation. Their acceptance and thus willingness to experiment seems too early, though I don’t love angst in excess I would like to see some in these characters. I think the scene with Ann and the cars would work better if it were more ‘accidental’. I agree with Catherine’s comment, Ann did refer to Ghost in an earlier chapter which could provide the reasoning for her to experiment with entering a living person. I did like this part and her emotional reactions. I am not sure of the physical interactions though, with both Chris and Ann I think there needs to be boundaries on how much they are able to interact / control the host body. The host Chris chose was having a similar crisis as Chris, yet we haven’t seen Chris really have any emotional ties or concern for his own child, this is a little bit disconcerting. I do think it is time to establish some ‘physical’ rules for them. What can they move, what can they touch, what can they walk through, what can they feel. What are the rules of their new situation. Catherine caught another of my thoughts as well, so I won’t repeat it. I do love the characters and their interaction. Most of their byplay is very good, very real. thanks very much. in the next chapter there is a physical test coming, and it won’t be the only one. i understand what you’re thinking about confusion and fear. yes, they do seem to be a little too at ease about their situation so far. i was using the excuse that – in death – there is a peacefulness that we can’t understand until we get there. however, that doesn’t make for good drama, so i will have to make adjustments. thanks – as usual – so very much. Lots going on in this chapter – I love the way they are continuing to experiment, but I think they ought to be a little more freaked out, or at least they could find it odd that they’re not freaked out! I didn’t get the incident with Ann and the car – it didn’t make sense that it could see her, and if it could, then it didn’t make sense that she’d just go ‘oh that was curious’ and walk away. I think you could have a lot more fun with this stage in their life/death – add in a bit more emotion and confusion. If one is freaking out and the other is calming them down you’d get a lot more action and excitement. I liked them entering people but again I think you could push this a lot further. For instance, if I was Ann I’d want to try a bloke on for size! I think it’s question time – if I was at this stage I’d be taking each chapter in turn and asking myself a thousand questions at every step – what are they feeling, wearing, seeing? How do they react to the things that happen to them and why? You’ve got a brilliant basic premise – and some fast paced dialogue in places – but in other places it slows right down – now it’s time to make it really exciting! Hope this helps – I’ll pick ch5 up in the morning (its 8.42 pm over here and I have a bottle of wine to crack open). I’m really enjoying your story, and I hope you don’t think for a second that I’m not. You’re really making me think about my own writing too and what works and what doesn’t for me, so thanks for giving me this opportunity – it really is a two way street. i’ll say thanks a hundred times and still won’t be enough. as for the car approaching ann – what was lost in there is the car doesn’t see her. it’s stopping because the train crossing gate was coming down behind her. but i didn’t develop it well enough. was thinking of cutting it, and now i’m sure of it. yes, about the freaking out, what i also haven’t developed enough is that chris’s character is normally rather anxious and nervous, and now he’s behaving rather opposite. slowly that’s coming out, but it seems it is too slowly. i need ann to do a better job bringing that out. in ch. 5 there will be an important physical test that examines what they can and cannot do, or have not yet figured out what to do or how to do it. thanks again, and enjoy that wine. i’ll open a bottle in about three hours after i make dinner for my kid. oh – and – thanks again. 99 more times. Question 1: Other readers thought that the scene with Ann testing cars to see if they would stop was awkward and just did not fit the story. How did you feel about it? It wasn’t awkward. I would hope I would, eventually, get around to doing that. Question 2: How did you feel about Chris and Ann “entering” people? Did it make sense for them to attempt that? That I know I be trying. Question 3: What do you think should happen when Chris attempts to walk through the door at the very end? I think they can walk through something if they choose to or some other reason like it, so I think they will go through it. my hearty thanks and thanks again for your always helpful input. For question 1, I didn’t really notice it being obtrusively awkward for Ann to test out her effect on the car. It kind of brought more confusion and suspension to the plate, letting the readers think that the taxi driver had indeed saw her and then realize it was from another coincident altogether. Maybe you might think of another way, but I think it’s pretty important one way or another for people to know that ‘people alive’ can’t see Ann and Chris. Q2 : I LOVED IT. I don’t know why, I found it great how you kept each person’s life and excerpts short and poignant about their life. It wasn’t too typical of a character, but enough of a stereotype for the reader to conjure up the rest of what they feel would have entered Ann and Chris while they were inside them. Plus, it was part of the humor I think that they went about to casual sit ‘on/in’ people. Q3: I have no idea ! It’d be tragic if Ann slams her face, at which point I’ll definitely be (devilishly) ecstatic to hear her smart remark. If they were indeed able to walk through it though, that would be rather cool to see the description. One point being it shouldn’t be too similar to the experiences of Ghost. My goodness, what a great way to wake up on a Friday morning. Everyone should be lucky enough to wake up and find something so positive. I am glad the crossing gate scene works for you. It did not work for everybody, so I do have some adjustments to make. I am thrilled that I have been able to give you so much anticipation towards what might happen next. As a writer, I cannot ask for more than that. Happy Friday to you and thank you again for coming back for more. Writing and story lines comes across different for everyone so I guess we’ll never be able to push out something that’ll be an ultimate people pleaser. Yes, it was indeed worth coming back, I slacked off a few days so I missed the previous chapters and caught up in one night, so though I’m lacking sleep now it’s worth it ! How else do they test if they can be seen though? It didn’t come across as awkward to me. Made total sense – if they can no longer feel things like sunshine or the motion of the train, why not try out other ways of finding sensation? Plus as an idea it’s one I’ve met before (I think Christopher Pike used it in one of his teen “horror” books, but only when someone was asleep and the person who was a ghost didn’t feel the same with the thoughts and feelings of the person whose body they were using). He should be able to walk through but only by closing his eyes, a bit like in Harry Potter when he goes through to Platform 9 3/4 by closing his eyes so he can’t see the wall. Or it should be possible but difficult, like walking through syrup. always love any harry potter reference. i like the idea of the syrup, and i think i will go back and edit that area to include something like that. thanks for that suggestion. Not a problem. Walking through walls is the one thing I would love to be able to do. It would save a lot of bruises!! I am only on chapter 4 but I can tell you I really want to see this through to the end so, you got me hooked and like an addict keeping track of his stash, how do I get the remaining chapters? A: it’s a good scene, but the end was a bit confusing when Chris points out why the car stopped. I think you are on the verge of a good humor moment there, just needs another tweak or two to really land it. It’s a good, believable way that they are feeling out what they mean in this incarnation; overall a worthwhile scene. A: Yep, especially the way you have Ann discover the ability to “hear” people by maintaining contact. Loving the story – the characters continue to flesh out and the pace is very good. Just enough questions to keep the story progressing, and just enough progress to feel like we aren’t mired in it and not getting anywhere. short reply is yes, i do eventually get into the explanations about the “ghost rules.” so i set up the questions to be answered later. i only have a few chapters up but when you are ready, i will gladly add the other chapters. it is a great thing to have someone want to read your work, and i will thank you early and often. and over again. so thanks.